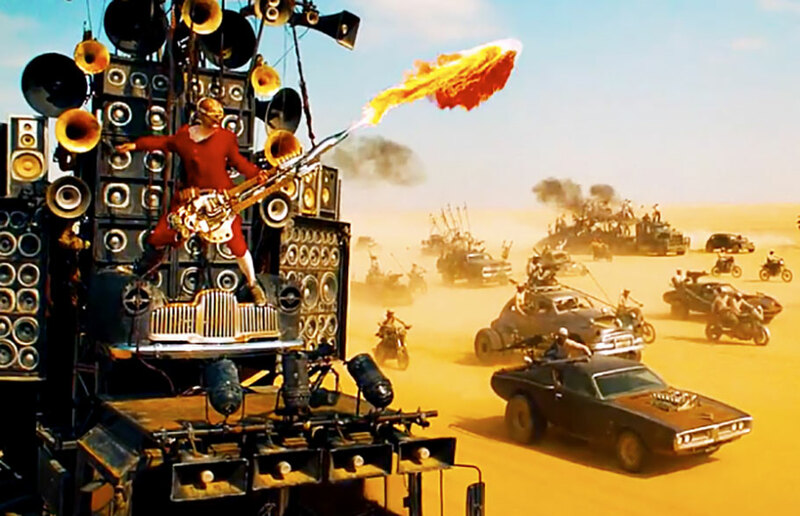 You could make a solid argument that George Miller’s Mad Max: Fury Road works brilliantly as a classic silent movie. The narrative is literally driven by action, action and more action, and actual dialogue is spare. Minutes often go by without a character speaking to another. But filling the void is a wall-to-wall musical score that reflects the insanity and accelerating chaos unfolding on screen. It’s an immersive, pounding cacophony conceived by Tom Holkenborg, a.k.a. Junkie XL, a Netherlands-born producer who’s become a close collaborator with Hans Zimmer. After finishing work on Zack Snyder’s 300: Rise of an Empire, Holkenborg was invited to Australia to meet Miller and discuss ideas for the sound and the fury of Mad Max. They immediately hit it off but it would take 18 months of painstaking work to get every note right. Mad Max: Fury Road debuts Thursday at the Cannes Film Festival, and when it roars into U.S. theaters this weekend, Holkenborg’s sounds of post-apocalyptic ultraviolence will inevitable be coursing through the brains and blood of exhilarated audiences. 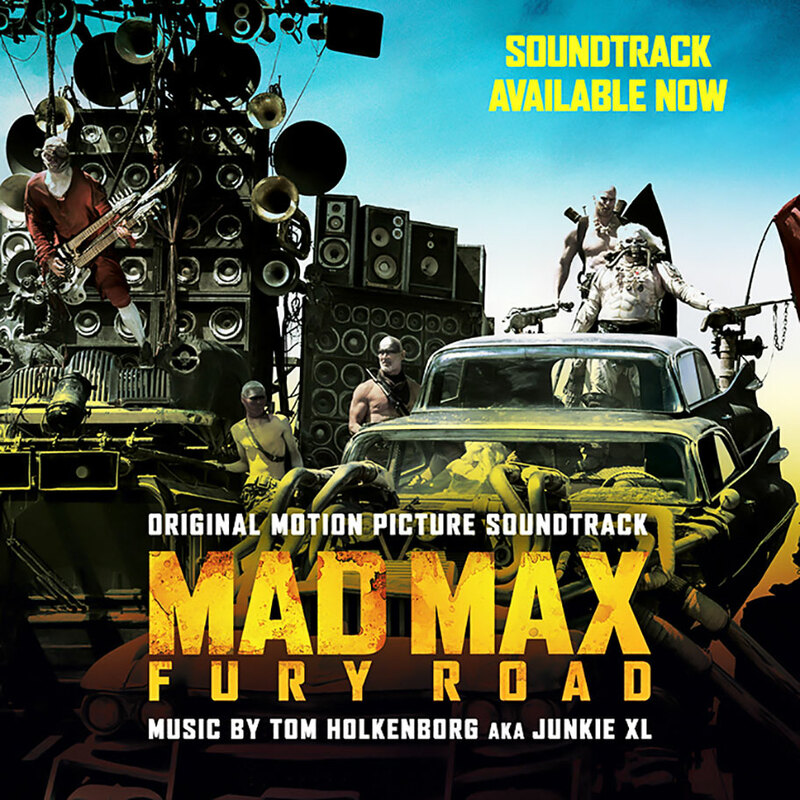 Holkenborg loved the original Mad Max films and the idea of composing an “over-the-top rock opera” that helped define the world Miller had in his head was an opportunity of a lifetime. After nearly two years of Mad Max, Holkenborg is busy with other notable projects, including the Johnny Depp crime drama Black Mass, the Point Break remake, and a little movie called Batman v. Superman: Dawn of Justice. The 47-year-old was silent on following in the footsteps of Zimmer and Danny Elfman to craft a new Batman theme, but he positively gushed about working with Miller and the world of Mad Max. Oh, what a day. What a lovely day! ENTERTAINMENT WEEKLY: How is George Miller different? How does he treat a film’s music differently than other filmmakers you’ve worked with? TOM HOLKENBORG: His way of getting to the final result is a very peculiar one. He can get into details right from the start. When I started on this film, there wasn’t a beginning and there was no ending—there was just the whole middle part, and that was two and half hours long. So I would score scenes, and he would get so detailed on little things. My approach would be, “You know, let’s get the broad strokes first, and then while the movie’s developing, let’s then go in to details.” But George goes straight into details. And his sense of detail is just remarkable. The amount of detail that goes into the cars, that goes into the makeup, that goes into the set design, that goes into how the camera is moving and how he cuts a lot of his shots. And that goes with the music too. George and I worked together in an extremely pleasurable fashion over the last 18 months to get this film done, on the music side of things, which is unheard of nowadays in film scoring. It’s usually like a few months or sometimes even a few weeks. Fury Road is an avalanche of a movie. As the person responsible for the sound of that chaos, where do you even start? I knew when I saw the film that we needed to come up with something that is a completely over-the-top rock opera. The wasteland George created and the caricature of the dictator Immortan Joe, the look of the war boys, the cars—it’s so over the top. The music needed to match that. If you see a movie like this, you might think you want to score this movie with a cello and a flute, but you’re not going to get away with it. You need to come up with something bold. So what I started doing first is focus on that one truck that had the crazy drummers in the back, and the guitarist up at the front. I made something for these guys, and that music became broader and almost became the voice of Immortan and the voice of the war boys. The other thing that I did is, I needed to come up with something that was very simple but very identifiable throughout the film. Mad Max is this really troubled character, with a really troubled past. He only has one instinct, and that is to survive. So when he breaks out of the Citadel and meets to save the women—or helps to save the women, I should say, because Furiosa [Charlize Theron] is the real heroine—he is really this uncontrollable animal. When he is in that big truck with the women, the women don’t know if at any moment, “Is he going to explode? Is he going to shoot us? What is he going to do?” So I wanted to come up with a very simple motif on a cello that plays, Dah-DAH. Or it plays three times. Or it plays five times. Or just once. You never know how many times. So that was kind of the musical statement that he could be dangerous. Then, where the situation seems to stabilize and he’s actually now collaborating with the women, that now becomes only two cello notes in a row—constantly two. Two feels more stable. It feels more grounded, so it feels more safe. The other theme I came up for him early on is that bending string riff, which is really inspired by the great scores in the ‘40s and ‘50s. George and both really loved that time period, with composers like Bernard Herrmann. So that string riff is almost like a reminder of Psycho. The string riff goes like Na-na-naa-naaa-naaaaa, Na-na-naa-naaa-naaaaa. That is the scoring of Mad Max’s psychotic state of mind. He’s constantly having these really crazy flashbacks. He doesn’t know where he is, where he’s going to. His troubled state of mind. So those were actually the things that I started with. Then, the last thing that was really left was the music for Furiosa. In the beginning, the only music that I’m using for her is a pulse. Everything around her has frenetic material, but musically, we really don’t get to know her until the point where she has the conversation with Max in the rig. That’s when the thematic music for Furiosa starts and it will continue through the end of the film. In most action films, the composer needs to be careful not to be too over-the-top, but as you said, you almost need that here. But how do you calibrate different themes, like a more delicate track like “Many Mothers,” which showcases strings, in order to tell a story? You’re pressing right on the pressure button there. That’s why it took 18 months. In retrospect, you can see what the main arcs are. The first arc starts when we get introduced to this wasteland and it goes all the way up to basically when that storm is over and Max just wakes up in the sand. That’s the only time where for 10 or 15 seconds, it’s absolutely silent and we just hear the sands coming off his face. And then the madness starts again. And then go all the way up to “Many Mothers,” the whole scene at night when they meet up with the women and when they’re talking—that’s when we let the pressure completely go and that’s when we come back to humanity. These people are interacting as humans, as warm people. And that’s why the music needed to be small and organic—none of that craziness of before. Then, obviously, the next day, when they’re going back, that’s the last arc, all the way to the end. You mentioned the guitarist and the drummers, who are like heavy-metal buglers for the war party. It is such an insane pursuit and the sound is just wall-to-wall. Did you see that scene and those characters first so you could equate the sounds with the visuals or did you have to fill in the blanks yourself? Let’s put it this way, if George did describe it to me, I would have no idea what to expect. When I saw the film, the very first shot I saw almost two years ago was that guitar player. That was the first shot I saw. And I was like, “What the hell is this?” It starts with Max escaping the Citadel and then these guys get on the war rig and drive out. Then, the camera pans around and I’m like, “What the hell are these drummers doing on the back of the truck?” And then, the camera pans around, and I’m like, “Oh my God, is that a guitar player?” It’s insane. So that was the first shot I saw, and the cue that’s on the soundtrack that’s called “Blood Bag” is that cue. So it was actually the first thing that I did. How would George express his likes and dislikes? He would say, for instance, when we play Scene A with Furiosa, “When I hear the music, it really hits my stomach and I really get this tight knot in my stomach that something isn’t quite right and that I feel for this character.” But then if we go to the other scene, let’s call it Scene B, [he might say], “The music is not talking to me. It’s not saying to me, ‘Oh, I should be feeling this or I should be feeling that. It just leaves me at a neutral place.’ And I don’t find that compelling.” That’s the kind of language he would use. I was interested by the HitFlix you gave where you talked about how you and George both shared a mathematical approach to art. Can you explain that? It’s the relationship between certain numbers. See, if you have rhythm that does, dun-dun-dun and you keep repeating it, at a certain point, it sounds boring and you miss storytelling. So what you want to do is, every two, you want to break it up slightly different, and then every four, you want to break it up a little bit more at the very end, and then over an arc of eight, you do the same thing. The relationships between those numbers is extremely strong, and [if you mix them up artfully], you get a sense of telling a story, just within the rhythm. So George and I started this conversation, and he was like, “That’s so remarkable because that’s what I do with film editing.” He goes by a certain amount of shots, and then a secondary amount of shots, and then he changes things around so it makes sense with the rhythm. He would see the film multiple times in a week, and then he would say, “I feel we need to speed up this shot by two frames,” or, “I think we need to take frames out there.” It’s remarkable how detailed he worked like that and he demanded that from the music too. It was for me Film Scoring 101 masters class. I learned so much from George, what true scoring of filmmaking is. And I will really miss that on the future projects I work on, because I got so used to this extremely safe environment that I call George Miller and it was an honor to work with him on a project like this. Eighteen months is unusual. Did you know it was going to be such a lengthy experience? No. [Laughs] People warned me. At the time, I was also working with some other people who have worked with George in the past, and I said, “Oh, this thing’s going to be done in April 2014.” And they joked and said, “You mean April 2015, right?” “No, no, no, April 2014.” They said, “Good luck, my friend.” And they ended up being right. You’re totally right on that one, but that’s the true power of George Miller. He knows that he’s asking so much from the people that work on his film, but he has this amazing way to re-energize the project. And that’s a magic that you have or you don’t have—and he has it. So he gets together with everybody and he has this really inspirational talk, and then once we leave that meeting, like 15 months into the film, you’re ready to revamp and revise all these things about the movie in order to make it better. Did you have to turn down other assignments because of Mad Max? Yeah. There’s one other movie that I did during this whole time period, which was Divergent. Mad Max was on hiatus for two months, which gave the perfect time to work on Divergent. But apart from that, I did non-stop work on this film. Yes, I got other offers. But I just wanted to see this through with George. When I noticed that this was going to happen, I just basically didn’t take on anything else. And I’m very happy I did.